Hey there friends! Happy June. I'm so excited for this month. Summer is my favorite and we're finally seeing some warmer summer-like (or maybe even spring-like!) temperatures here on Cape Cod. It had been cold and breezy (and rainy!) for weeks before I left on my trip to France, Italy & Spain for the Stampin' Up incentive trip last week (more on that later). So while it has been a little cloudy the past couple of days, the warmth is a welcomed addition. 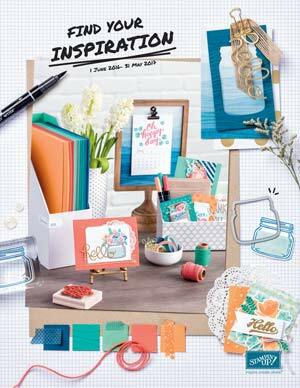 Anyway, in case you haven't heard - June 1st is also new Catalog Day at By the Shore Stamping. And this year's Stampin' Up catalog is gorgeous. Did you get one? If not, (and you don't already have a demonstrator), I'd be happy to send you one. I just charge $5 (unless you have purchased from me in the last year) and you'll receive a $5 coupon to use on your first order (so it's really essentially free!). Just email me at jen pitta at comcast dot net and let me know you'd like one. I love to pour over my new annual catalog for weeks (sometimes months!) after it comes out. There's always so much to see -- new products, samples, color combinations! Last year, I included tips for "how to view the new catalog" in one of my weekly emails and everyone seemed to enjoy it, so I thought I'd share my method for going through a new catalog again here. Of course, the first time I go through the catalog, it's just a thorough (yet not too in depth) look at what new products are introduced. I try to read through all the sentiments and find the really unique ones. I do glance at a lot of the samples, but I don't analyze them too closely yet. That's next. This time I look at all the pretty samples. I check for cards I might want to copy exactly, card layouts I might want to try and color combinations that I love. I often will have a stack of post-it notes nearby at this stage so I can flag the samples I like with a "copy," "sketch" or "color combo" note so I remember when I go back. The third look is all about stamps. I will normally go through with a highlighter and highlight any of the sets I already own. I used to do this with ink pads, too, way back in the day, but well, now I own them all so there's no question about that (wink, wink). Here is where I am realistic. For me as a demonstrator I pull out my calendar and see what events I have coming up, I see how many free sets I have earned (yes, this is an amazing perk of being a demo!) and I dive back into the catalog. As a customer, I would think about what projects you have on the docket, what "holes" you may have in your collection (do you need sentiments? Christmas stamps? Not enough Get Well? Kids themes?... etc.). Then I start at the beginning of the catalog and I analyze each set (sentiments, images, occasions covered) and I decide which are must haves. I do the same thing with embellishments, Big Shot items, tools and paper. I usually select at least one whole product suite (maybe two, or three) that I can purchase just because it makes life so dang easy. Everything is already thought out for you and there is no worry about "will this coordinate?" My favorite suite this year is of course the one called "By the Shore." Now a couple of tips... have a budge in mind when you start. Then you can narrow it down if you are over on your first (or fifth!) run through. Try to take inventory of your current supplies before you sit down with the new catalog. This way you'll know what you truly need and what is an "extra." And finally, don't just open up the computer and start entering items into your cart - this is very, very dangerous (ask me how I know! ), but really fun! As much as I'd love to have your great big giant order, we really don't want any buyers remorse tomorrow (wink, wink). AND, if you have a really large list that you just can't narrow down... maybe you should consider the Ultimate Stamper's Bundle. It's just $99 plus tax and you get to select $125 worth of product of YOUR CHOICE. Plus, if you purchase the bundle in June you can also add two additional stamp sets (of any value) for FREE! This is such an amazing deal. And while it does officially make you a demonstrator, there is no obligation to sell or host classes if you don't want to -- and of course, you'll have me to help you if you decide that earning a little cash doing something you love sounds like a good idea. You can purchase the kit here (just scroll down and click on the purplish-pink "join" bar about half way down). Are you ready to browse all the pretty things? You can shop here. Let me know in the comments below how YOU go through the new catalog. Curious minds want to know!